So I’ve known about the trick for finding spiders with a flashlight for a while now. You take a fairly powerful flashlight, hold it close to your eyes, and shine it on the ground. Spider eyes will wink back at you like little green gemstones. Since I’ve learned about it, I search for spiders on every camp out. During my week at Camp Comer I saw a particularly fat wolf spider near the bathroom. I looked for its eye, and saw multiple glimmers. Confused, I looked closer and discovered its whole back looked a bit like a disco ball. I’m pretty sure it was covered with baby spiders. 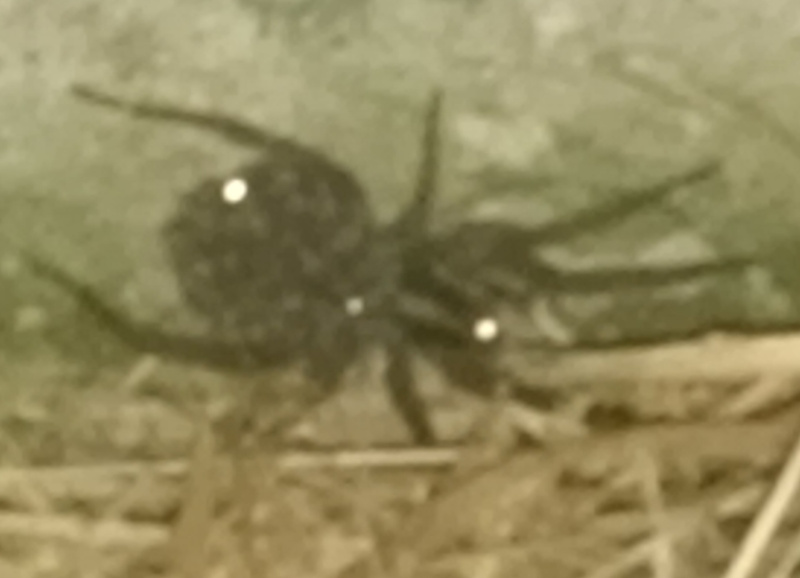 In the picture at left you can see the spider’s eye, and two of the babies (that’s all that showed up in the flash). Trust me. There were many more babies smiling for the camera.